Crystal clear water, white, sandy beaches, people sunbathing at beaches and cottages along the coast set a different atmosphere at the exotic cluster of three tiny resort islands nestled between the famed islands of Bali and Lombok. The best and most developed of the three isles is Gili Trawangan. Its stunning beaches, the bustling nightlife, breathtaking landscape and friendly islanders make this place truly admirable. Day after day, more and more tourists tired of Bali’s crowded beaches and jammed streets spare a one-hour trip by speed boat to Trawangan, the largest of the three islets. The other two, Gili Meno and Gili Air, are quieter and more private. At Trawangan, traditional restaurants and modern cafes line the beaches, while tourists leisurely stroll around in bikinis and shorts, blending in with the residents. These beaches are cleaner and quieter than the more famous beaches in neighboring Bali. In the local Sasak dialect, gili means “islet” and Trawangan means “tunnel”, which residents say is a reference to a defense pit built on the isle by Japanese forces back in the 1940s. Another wonderful thing about Gili Trawangan is that you can breathe clean air and enjoy traffic-free roads because motorized vehicles are strictly prohibited. Only two transport modes are allowed: horse-drawn carts and bicycles. The horse-drawn cart, or cidomo, is ready to take you on a one-hour tour around the island for Rp 125,000 (US$15). You can also rent a bike for between Rp 25,000 and Rp 50,000 for the entire day. Some visitors prefer to tour the island on foot because it gives them freedom to stop at places they like or interact with locals. On foot, it takes three hours to enjoy the island’s beautiful landscape and amazing views, while on bicycle you can go around in just one hour. Life is concentrated on the eastern coast, where most of the hotels, inns, beach-side cafés and restaurants can be found. In this bustling area of the island, life begins after sunset. People crowd cafes and pubs, which stay open until dawn. As a rapidly developing resort, Trawangan already boasts a wide range of accommodations. A low-budget bungalow costs visitors a mere Rp 75,000 per night, while star-rated hotels can set you back up to Rp 2 million per night. The most popular leisure activities on this island are snorkeling, diving and surfing. The Trawangan Sea is famous for its rich biodiversity, enchanting coral reefs and beautiful sea creatures; especially turtles. The three islets have been designated as a turtle hatchery and conservation sanctuary. Among the best tour on offer is a trip around the three gilis (islets) on a glass-floored boat for Rp 100,000, allowing visitors a peek at the breathtaking underwater landscape. Snorkeling is another great option, with equipment available for rent at between Rp 15,000 and Rp 50,000. Gili Trawangan, Gili Meno and Gili Air have become popular for both beginner and experienced divers, with some 25 dive sites around the islands with a variety of canyons, slopes, ridges and diverse marine life; from lionfish, cuttlefish, clown fish to colorful corals. 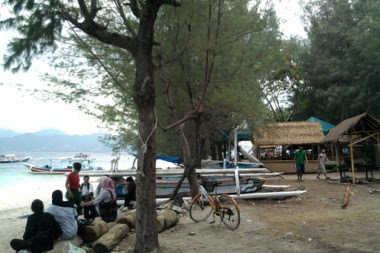 Trawangan has many diving courses which can arrange tours and lessons at a cost starting from $30. The waves are perfect for surfers; not too high and the current not too strong. Manta Dive is the most famous spot for surfing and is always crowded. If water activity is not your thing, you can chill out and embark on culinary adventures, tasting different menus – from French, Italian, Japanese and Indian food at beachside restaurants and cafes at reasonable prices. At dawn, the spectacular sunrise over the majestic Mount Rinjani in Lombok is not to be missed. And when the night falls, one can view the breathtaking sunset that illuminates Bali’s towering Mount Agung in the west. It paints an unforgettable memory that lasts forever. The best time to go to Trawangan is during the low season, between January and April, or between September and November. During this time, airfares are not too expensive and most lodgings, restaurants and rentals will offer their lowest rates. Most foreign tourists are “spillovers” from Bali and they come by speedboat. They set out from Padangbai Harbor and it takes between one to two hours to get to the Gilis, depending on the weather. There are more than 12 speed boats, with a capacity of up to 80 passengers, each serving the Bali-Gili Trawangan route. One-way ticket prices range from Rp 600,000 to Rp 690,000. Gili Trawangan can also be reached from Lombok’s Selaparang International Airport. From the airport, go by taxi to Bangsal, Teluk Nare or Teluk Kode – the jetties which connect the mainland and the three isles. From there, take a regular or speed boat to the Gilis. It costs Rp 10,000 for a regular boat ticket to Gili Trawangan for an approximate 30 minute trip. Always ask for the price first before you order food or rent something to make sure you don’t get ripped off. If you want to take a tour, never hesitate to haggle with the service provider to get the best price. Local residents are generally very friendly. You may consult them for the best places to stay and eat. Before you take a horse-drawn cart, or cidomo, always tell the driver to travel slowly, otherwise he may move too quickly across the bumpy roads. The weather in Trawangan is extreme; sometimes it’s very hot in the morning followed by heavy rain in the afternoon. The best place to buy souvenirs is the Pasar Seni art market near the harbor. bravo mas sugeng,, salam kenal..